North American gasoline consumption is expected to decline over the next few decades, driven primarily by greater fuel efficiency in the vehicle fleet, and secondarily by penetration from alternative engine technologies. Generally, gasoline consumption trends between Canada and the U.S. have mirrored one another; however, the emergence of disparate market conditions are increasing the likelihood of comparative differences over the next couple of decades. Year-over-year growth of North American gasoline consumption has slowed since 2015. 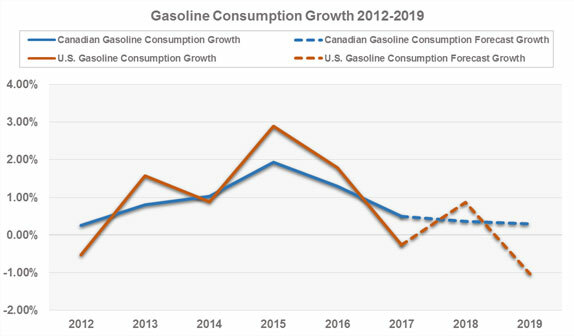 Over the next couple of years, Canadian consumption of gasoline is expected to grow at just 0.3 percent annually, while U.S. consumption is expected to decline just over 1 percent annually by that same time (Figure 1). According to a recent analysis by the National Energy Board, Canadian demand for transportation fuel is expected to decline an average of 0.5 percent annually to 2040.The Energy Information Administration’s (EIA) 2018 Annual Energy Outlook, showed that U.S. demand for transportation fuel would decline an average of 0.7 percent over the same period. The steeper decline in the U.S. is largely a result of growing differences in the vehicle fleets between the two countries. Between 2007 and 2016, the size of the Canadian vehicle fleet increased 17 percent (Statistics Canada), while the U.S. fleet increased roughly 5 percent (EIA). Similarly, the aggregate number of vehicle miles travelled (VMT) increased in both countries over the past decade, and the EIA’s forecast calls for growth in the vehicle fleet and VMT beyond 2040. This obviously has not resulted in a parallel increase in gasoline demand, and over the coming decades, most forecasts predict much lower gasoline demand. The principal reason for the expected decline in consumption is a significant rise in the average fuel economy of the vehicle fleet, which the EIA expects to increase by over 60 percent to 2040. As governments enforce more stringent emission standards on new vehicles, the average efficiency of the vehicle fleet will rise as the fleet turns over – meaning internal combustion engine (ICE) powered vehicles will consistently lower their average fuel consumption per 100 km (Figure 2). This shift in efficiency is also influenced by the spread of alternative engine technologies into the market and will be led over the next few decades by an expected surge in electric and fuel cell vehicle sales. However, the bulk of the decline in gasoline consumption will be related strictly to the increased efficiency of ICE vehicles, while a much smaller portion will relate to the displacement of ICE vehicles by alternative engine technologies. This is apparent in the breakdown of VMT by vehicle type, where ICE vehicles currently account for 97 percent of U.S. VMT. 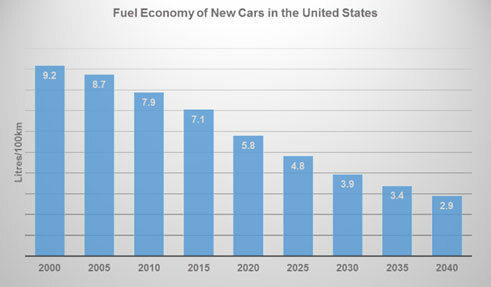 Even with an expected 4,000 percent growth in VMT from full electric and fuel cell vehicles by 2040, the percentage of VMT for ICE vehicles would still be around 86 percent in 2040 (EIA). Changes to the vehicle fleet are clearly impacting gasoline demand trends in North America, and the disparate outcomes projected for the U.S. and Canada are driven primarily from consumers’ vehicle preferences and the resulting differences in their respective vehicle fleets. The percentage of new vehicle sales categorized as trucks rose 20 percent over the last decade in Canada, while in the U.S. that same figure rose only 12 percent. (Figure 3) Canadians are buying trucks at a much higher rate than passenger cars, and despite each respective vehicle class becoming more fuel efficient, consumers are more frequently purchasing a less fuel efficient class of vehicle. Increased truck sales, and the corresponding decline in passenger car sales, is likely to have long-lasting effects in the Canadian market. The rate of new vehicle sales and turnover in the fleet is close to 5 percent annually, meaning it takes roughly 20 years to completely turn over the fleet. Consequently, the significant rise in truck purchases will continue to dampen some of the gains in vehicle efficiency over next couple of decades. In addition, the rate of penetration for alternative engine technologies in Canada has consistently lagged behind the U.S. market, meaning that ultimately Canadian gasoline consumption is likely to fall less than U.S. consumption by 2040. A potential wild card for future Canadian gasoline demand is the effect of carbon pricing. By design, carbon pricing raises the cost of fuel, incentivizing more efficient vehicles and alternative engine technologies. The current federal approach seeks to price carbon at a minimum of $50 per tonne by 2022, adding roughly 12 cents per litre to the price of gasoline. While this and other future carbon-reducing measures are likely to result in some downward pressure on gasoline demand, we have observed little to no impact on demand from current carbon pricing schemes. Ultimately, the effects of carbon pricing on Canadian gasoline demand will be “swimming upstream” against consumers’ recent preference for larger vehicles.